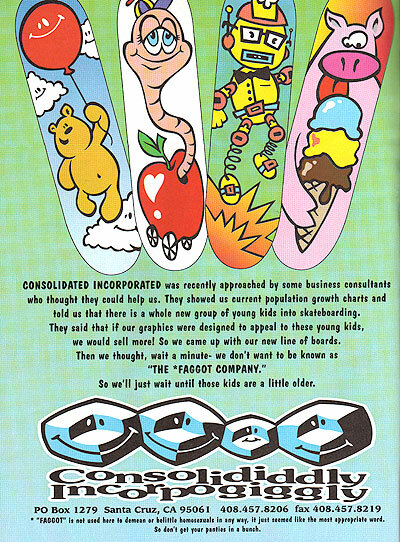 In the ’80s it was surf apparel, in the ’90s it was skate and urban/hip-hop clothing. Now it’s just all clumped together as “streetwear,” but let’s be honest here. It’s the same t-shirts, hoodies, jeans, and baseball caps. The industry’s following the same trend cycle in the youth fashion marketplace as it has for the past 2 decades. A spawn of rogue indie upstarts kick things off, end up influencing the corporate pirates who buy in, as the indies subsequently sell out. Around this time of the phenomenon, the tradeshows get flooded, stores and labels multiply, and the treasure chest is bottomless. Then, after a few years, sales plateau, tradeshows deflate, and the trends blow out. Rinse. Repeat. More than a decade ago, the skateboarding industry was experiencing a very similar evolutionary process as ours is today. Since the skate biz was comprised almost entirely of free-spirited independents at the time, when the X Games blew up the spot by the mid-’90s, it was an overnight Gold Rush to go huge. Again, parallel to our (and our peers’) situation today, small companies were suddenly forced to grow up, as the pirates moved in and fellow competitors chased dollar signs. Many caught the wave, others fought it, but almost all were forced to deal with the realities of surfacing in the mainstream in their own way. 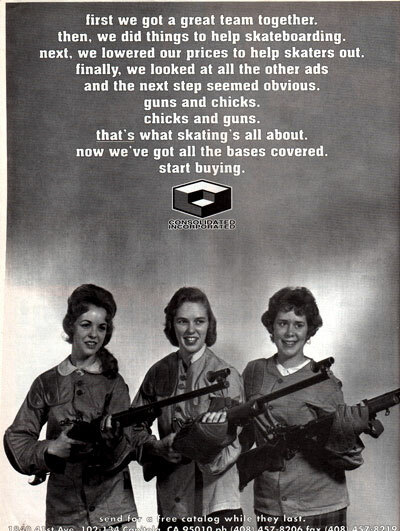 Since the web wasn’t so worldwide at the time, and the mainsream media wasn’t so boardsports-friendly, skate companies relied heavily on advertisements in print publications to showcase their lifestyle, ideology, and most importantly, their voice. 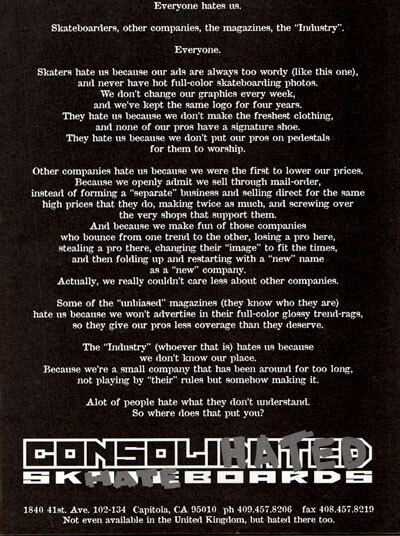 Switch brought over his entire collection of Thrasher skateboarding magazines from the mid-90s, and I just had to share some of the best ads. 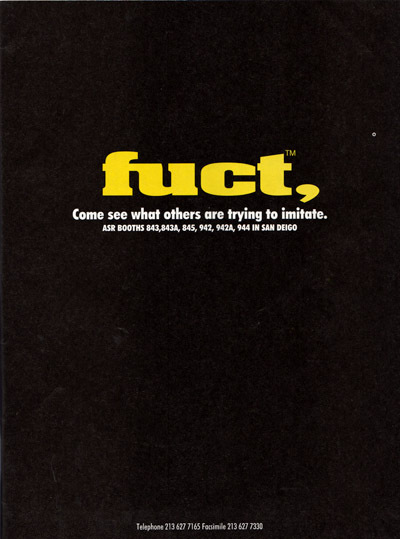 They’re from Fuct and Consolidated, who were both known for using their adspace as a conduit for their stark opinions on what was going on in the business around them. 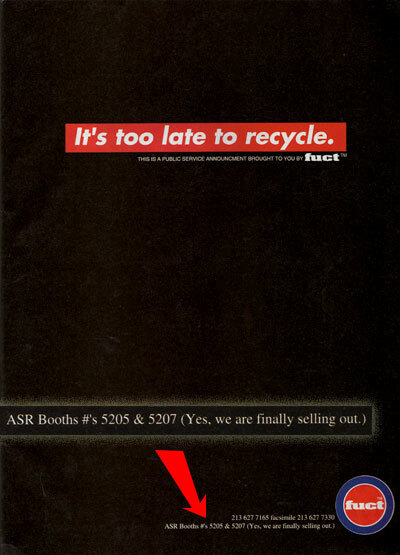 Both brands are still very much alive and well today, and still staying true, telling it like it is, and keeping it real with their customers. All while maintaining their sense of humor, and not taking themselves too seriously. Gotta respect that.